Bambi is a lovely movie about a baby deer’s mother getting killed by hunters. Oops, forgot to say “spoiler alert”. But seriously, everyone knows that already, right? I’m not giving away any secrets. Actually, I would venture that, not only is the whole global population aware of the fact that Bambi’s mother dies, but for 80-90% of the population, that’s the only thing they know about Bambi. Like, on a scale of 1-10, I would say that Bambi’s mother’s death really overshadows the rest of the movie. Which is a shame because Bambi is a good movie. 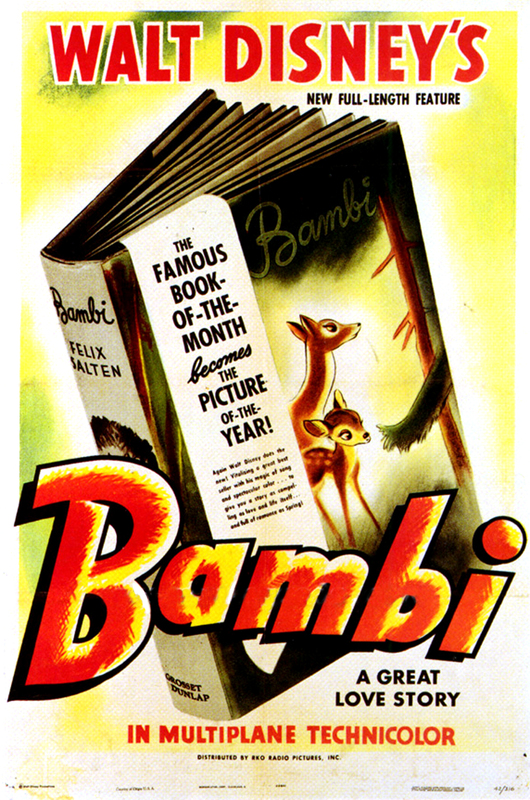 Released back in 1942, Bambi was the last non-package feature until Cinderella in 1950. I know it sounds ridiculous, but apparently the film was originally hoped to premier in the 30’s until animators couldn’t figure out how to animate deer convincingly. That’s so nuts. Animators today can make anything they want as convincingly they want – the challenge is in the fine-tuning. But back in the 30’s? Fine-tuning wasn’t quite on the agenda just yet. Still, the Mouse Guys were able to pull off a movie that stands up even 71 years later. What works best: The art. Bambi has some beautiful artwork. The shots of the woods are striking, often appearing as a moving painting, which is kinda accurate. I love it. Also, when you watch, you’ll notice there is a technique in play in which the main characters are surrounded by very detailed drawings while the outer edges get less detailed as they recede from the object of focus. That gives this film a very stylized feel, and I like it. FYI: this technique was pioneered by Tyrus Wong. In my research, I discovered that Wong is still alive; he’s 101 years old!! I love that I could still go somewhere and meet the guy responsible for the visual style of Bambi. I wonder, does he consider Bambi one of his best achievements? I wonder what he’s been up to these last 71 years. I digress. Having said all those good thing, I must say, the artwork isn’t flawless. Some of the colors are a little harsh for my taste, especially in Flower’s flower scenes. But by and large, the drawings and coloring work very well. So well, in fact, that they’ve influenced many animators who’ve followed. For example, Pete Doctor (Pixar, Up), is on record discussing how much the artwork stands out to him. He addresses the variety of artistic styles present and how they all work together even though, taken separately, they may not seem to fit. Cool stuff. BTW – I love seeing young guys being “mentored” by the old masters. It feels right, as it reinforces the idea that it’s good to respect elders. That seems like an idea vanishing from society, and I love to see it alive and well in animation. What isn’t the greatest: The story. I feel mean typing this, but I think the plot might seem pretty silly for anyone under the age of 12. The reason I feel like the older audience is lost is that there just isn’t much going on. The beginning is just a lot of scenes showing Bambi struggling to learn about life. Then, about halfway through, his mom dies (tragically), and then he comes back and finishes things out by showing that he’s learned how to be a leader and having fawns of his own with Faline. It is pretty simple and childish. I know some people might like that (see the next paragraph), but I have to warn any adults thinking of revisiting the film that it can be a little boring, especially if you’re looking for a struggle against a well-defined antagonist. The main antagonists seem to be “man” and lack of experience”, but those don’t make for a heaping dose of excitement. Except the final fight against the forest fire and the hunters – that is pretty cool. Now, before you vilify me with your minds, I think this weakness can also be a strength. If you’re looking for a story that’s different than the norm, Bambi has that in spades. While it’s not the most exciting, and while “man” and “lack of experience” aren’t the shiniest villains, the struggle is a beautiful one to see played out. Don’t we all struggle against unseen forces? Don’t we all struggle against lack of experience? 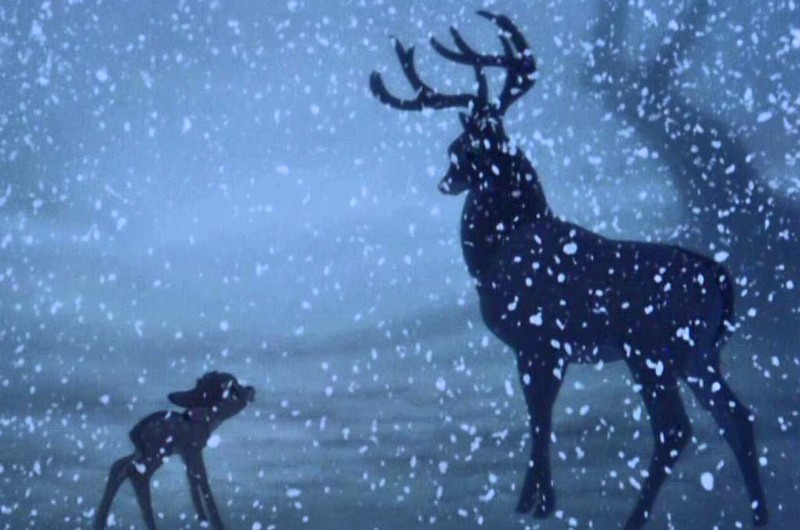 On a rather deep level, Bambi‘s story actually becomes a major strength. It’s simply too artsy for me to expect it to appeal to every person who watches it. But you know what? I wish it would. Bambi has one of the all-time great characters in Thumper. Almost every scene he’s in is enjoyable. NOTE: other than Bambi’s mother dying, Thumper was the only thing familiar to me. Even then, I’d forgotten he was in Bambi. Again, the mother’s death overshadows almost everything. 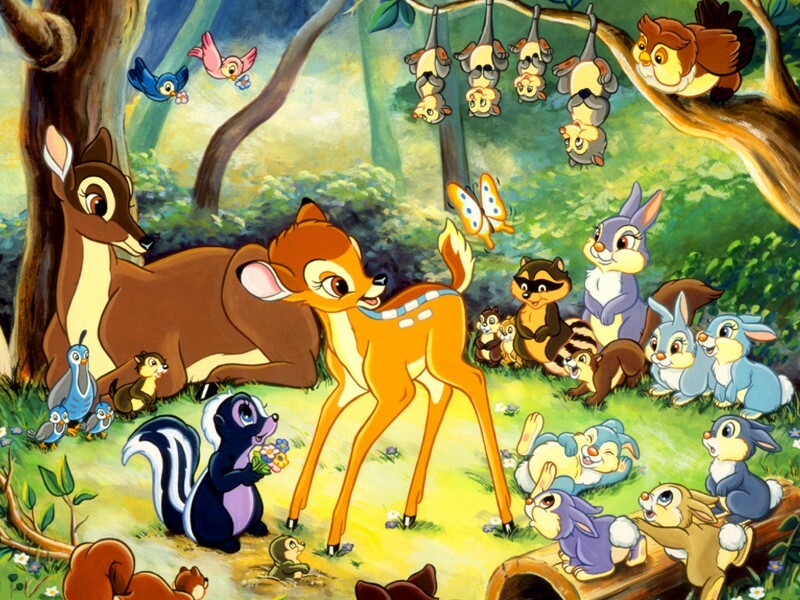 Apparently, Bambi II is one of the best DisneyToon sequels made. I haven’t watched it, but I’ve heard it shows what happens between Bambi’s mother dying and his return to the forest in the springtime. Might be interesting. 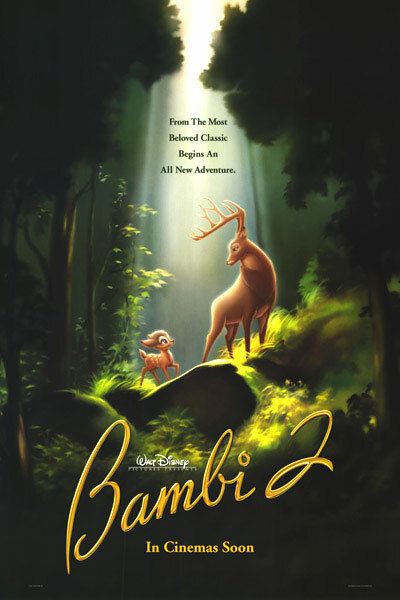 Click here to purchase Bambi 2 on Blu-ray and DVD. This is the only movie I bought during the whole Watchfest. Hayley had most of them, and the others I was able to find on Netflix or Amazon prime. But Bambi, no such luck. Of course, I probably could’ve rented it from Family Video, but since the demise of movie rental places, I didn’t even think to visit Family Video. Now it’s too late – apparently Amazon doesn’t accept the return of opened and used merchandise. Bullies!! 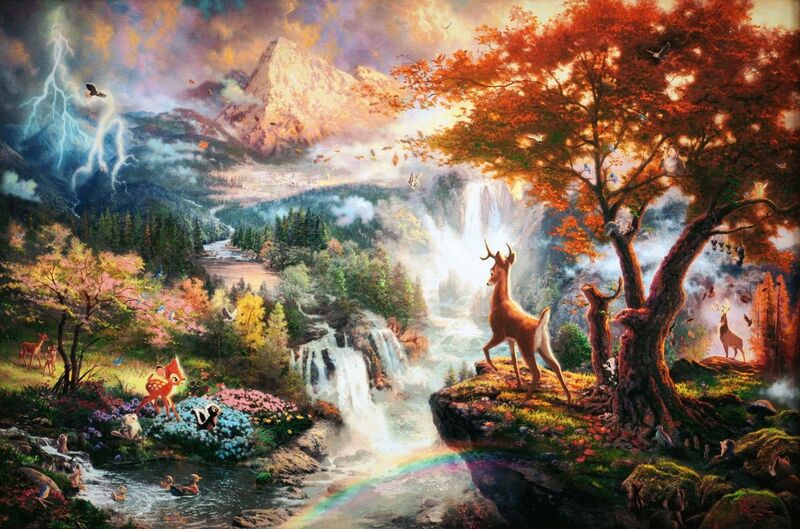 In conclusion, Bambi is a good movie, especially in terms of artwork. However, I feel like the unconventional storyline might make take the score down a few notches for some. For me, I give it an 8.0/10; for everyone else, 7.7/10. 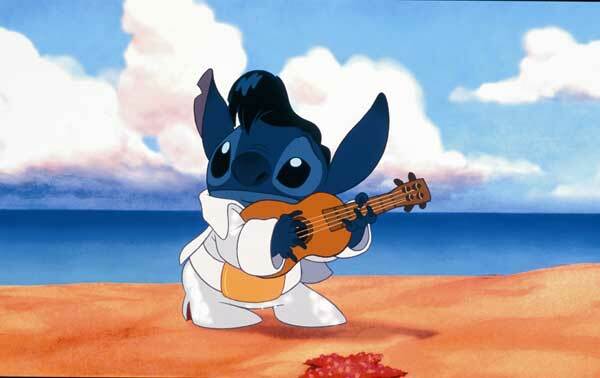 Stitch belongs with the classics. By 2002, Disney were no longer the kings atop the animation mountain. With Toy Story, A Bug’s Life, Toy Story 2 and Monsters, Inc. already in the can and a little film called Finding Nemo on the horizon, Pixar had established themselves as the new kings of the hill. * In fact, we now know that the little CGI film company was just starting one of the great runs in cinema history that would continue all the way through 2010’s Toy Story 3. But getting back to 2002 – while Disney were no longer the kings, neither were they paupers. They’d just finished a run of their own; from 1989-1999, the Mouse Guys made nearly $4 BILLION on their animated features alone. So they weren’t exactly hurting. But, in Pixar’s shadow, they were quickly being forgotten. After the surprisingly-good-but-under-the-radar The Emperor’s New Groove and the surprisingly-bad-and-unsurprisingly-under-the-radar Atlantis: The Lost Empire, Disney were quickly becoming an afterthought. 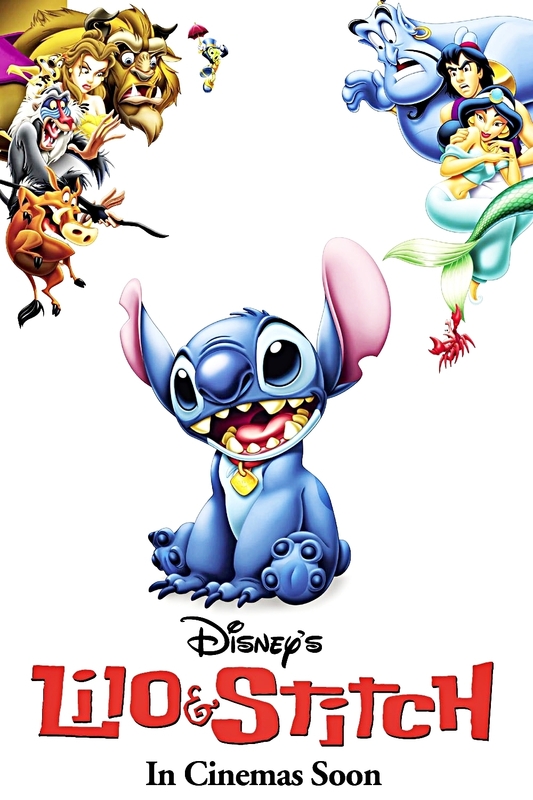 That’s a shame because their next picture, Lilo & Stitch is definitely one of their best. With an imaginative story, pretty visuals, good voices and state-of-the-art hand-drawn animation, L&S might’ve been a HUGE winner even three years earlier. As it was, the movie still made over $270 million at the worldwide box office, but compared to the $500+ million earned by Monsters, Inc. that figure seems paltry. 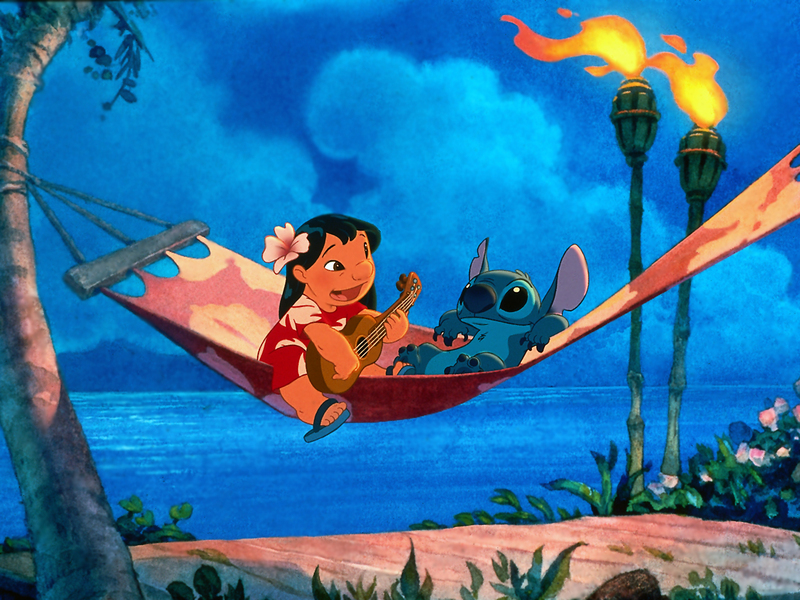 Lilo and Stitch are in a hammock. Story: After making their name with fairytales and musicals, Disney showed a remarkable desire to branch out at the turn of the millenium. The aforementioned Emperor’s New Groove is neither a full tilt fairytale nor a musical, and the equally aforementioned Atlantis is even moreso not a fairytale or musical. Lilo & Stitch continues the trend with an original, fun, breezy, non-fairytale/musical sci-fi-ish story. Probably one of the best features of the story is the setting. This thing is set on Hawaii!! Aloha!! The tropical backdrop makes for some very cool moments that would never arise in earlier Disney joints, and it seems like the distinct setting really inspired the writers. There are lots of fun moments throughout, but as fun as the story is, it will really tug at your heartstrings, too. Uncle Walt said that for every laugh there should be a tear. That is definitely the case in L&S. Visuals: This movie is very, very pretty. Being set on Hawaii probably makes that easy, but still, L&S is full of lush beauty. I love the colors of the trees and buildings – they seem really pleasant without being overly stylized. And I love the colors and design of the ocean and waves; it would seem that hand-drawn animation is extremely well-suited for bringing such things to life. There is also a sci-fi element to the film which really stands out visually. The aliens are brightly colored, and since they’re more futuristic and robotic, they make a nice contract against the normal human/Earth stuff. Altogether, this film just feels really breezy, and the visuals really help to make it so. Which one is Ving Rhames?? Voices: There’s not a ton to say about the voices – I just think they’re really well done. The directors chose to use professional voice actors rather than just getting well-known actors and hoping for the best. This choice really works, as the voices are buoyant and lively. The only exception I noticed was Cobra Bubbles (btw, one of the greatest character names EVER). He is voiced by the one -and-only Ving Rhames. I’m not gonna lie – I got VERY excited when I heard his voice. If the directors were going to use only one well-known actor, I think they’d have been hard-pressed to top old Luther Stickell. In summation, the voice cast is spot on. 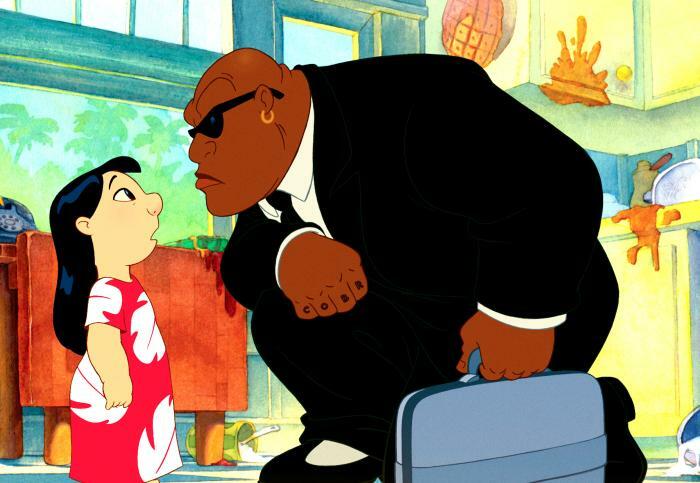 Animation: Lilo & Stitch looks great. Not just the artwork, but the animation too. It has smooth, impressive movements that are personalized for each character. So, Stitch can be lightning quick (he was built to be a killing machine, something like an alien ninja assassin) while Lilo is childish and a little slower and more deliberate. Nani (Lilo’s bigger sister) is more coordinated, while David (Nani’s would-be boyfriend) is smooth and athletic, an expert on the surfboard. The individual styles really ratchet up the appeal of the film, as each character feels very unique. Overall, this is Disney’s hand-drawn animation at it’s finest. 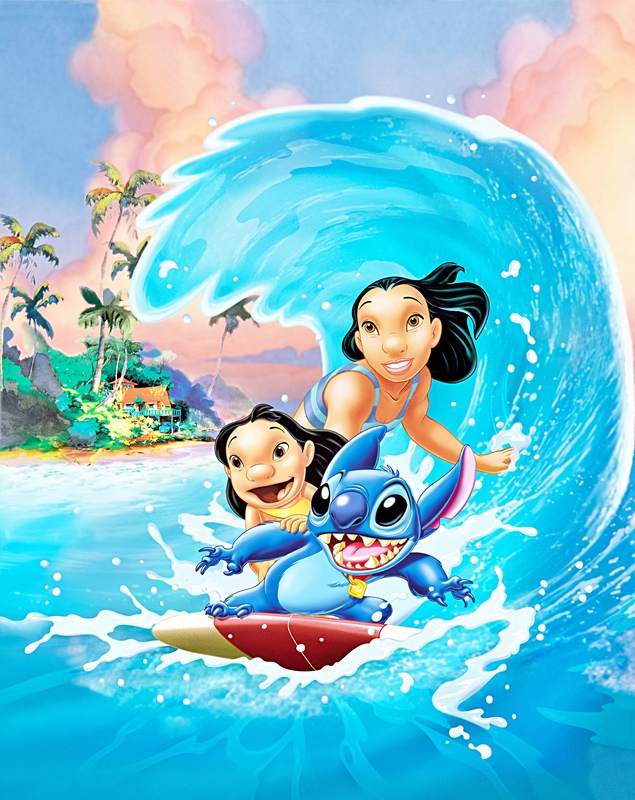 To close, I would say that Lilo & Stitch is a diamond in the rough, a forgotten Disney masterpiece. It has a breezy story, gorgeous visuals, superb voice acting and well-done animation. And, though I didn’t mention it earlier, it also has a fun Elvis-themed soundtrack. I think this belongs in the pantheon of great Disney movies, and anyone looking for an animated fix would do well to check it out. 8.1/10. * – I know Pixar and Disney are connected. When I compare them, I am really comparing Pixar at Disney Feature Animation, Disney’s in-house equivalent to Pixar. Grant Stevens is a freelance writer who really thinks that Hakeem Olajuwon and the rest of the 1994 and 1995 Rockets teams are completely and totally underrated. He would like everyone to know that Michael Jordan himself was glad to not have to face Hakeem in the Finals, as he knew the Bulls had no answer for the big man. Someday, those Rockets teams will be rightfully recognized for the great teams they are!!! Until then, check out Grant’s music at www.grantstevensgroup.com. Great reviews, Grant! Now I want to see Lilo & Stitch! Keep up the great work – you are almost finished!! !